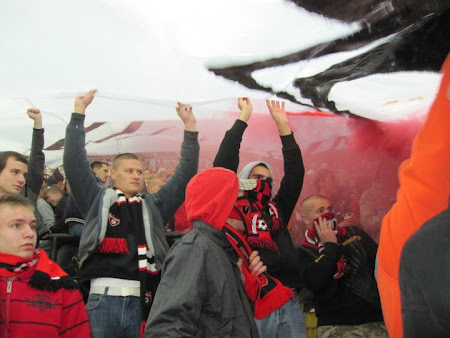 Have Spartak Trnava got the best fans in Slovakia?. Despite only having a smallish population, the Bíli andeli (White Angels) pull in a fair sized crowd infamous for their noise, colour and passion. Most travel to away games as well where unfortunately, some incidents have also earmarked them out for criticism in the uber-hooligan department. You can only speak as you find though so EFW went to see what they were all about. This was always going to be the highlight of the 2010 EFW Oktoberfest which to recap is annual event of twenty-nine lads from all over Europe attending several matches within a space of a few days. On the morning of this game, we'd been a few kilometres north in Trencin enjoying a Division Two match, and now it was the turn of Spartak Trnava - a team whose fans reputation precedes them somewhat. We arrived by coach. That coach. It had chugged through the gears from Budapest, to Trencin and now onto the Trnava - a city in western Slovakia just north-east of Bratislava. At least we arrived in time for kick off - or so we thought. I'd arranged to meet Marian Cerny, Marketing Manger of the club to hand over our match tickets. It was a good job I did because there were chaotic scenes outside the ground just before kick off. That saved us us one queue, but there was still another to negotiate. Tickets were €4 by the way - Na zdravie Mr Cerny! Queues o'clock just before kick off. Confetti. Photographer of year gong not in post. Security is tight at the Stadium of Anton Malatinský - well sort of. Just two electronic turnstiles were open to cope with the impatient crowd of thousands waiting to get in. As tempers flared, a few stewards shrugged their shoulders, until eventually, they opened a big set of gates and the baying mob surged in en mass. I'd been told that tanks are often on patrol in these parts to control the crowds, but they weren't in evidence for this match in the top division on the Slovak league, or the Corgoň Liga to give it the correct title. Corgoň being a Slovak brewery (I thought you might know that - Ed.). Instead we just had around 100 local policemen for company. Quite a few considering the visitors had very few away fans, but then one has to factor in the events of the previous week in Senica where evidently their fans had ran a mock. Marian had assured us that sitting in with the Ultras Spartak was fairly safe. So - after a bit of faffing to get in - the twenty-nine of us procured pints of beer for €1 each and took the stand behind the goal. It was a lot to take in at once. We had to wade ankle deep in confetti to take to our seats, flares were being fired off, streamers were launched onto the pitch and Jesus H. Christ the floodlights were the hulking great Eastern European ones that you dream about. A good start no? A huge bit of netting had been set up in front of the stand, which is common practice to contain the hail of missiles from exuberant fans. However, the mandatory toilet rolls (which I'll hold my hands up and say I used to love throwing onto a pitch in my youth) had been replaced by till rolls. A little more sinister, and smaller of course, enabling them to sneak through the netting and onto the flight path of the opposition goalkeeper. Things were a little more tranquil in the away end. The match ebbed and flowed nicely, helped enormously by a referee who didn't want to blow his whistle for anything. I loved him. I hate pernickety officials who stop the game for every minor offence. If I wanted to watch a game that stopped every two seconds - for no reason whatsoever - I'd follow American Football. This is football. Get on with the game man, but first could you clear those streamers, there's a good chap. Refreshed by beer at half time we took to our seats to erm, stand again. Now it was time for the terrace display. Up went a huge flag of the Trnvavsky Kotel. Kotel means boiler and it's a word they use for the heart of the ultras section. We were in the thick of it that's for sure. Underneath the flag all sorts of naughtiness was occurring with smoke bombs and more flares being set off. These were lit by fans under the 'safety' of the flag because they're banned items in the stadium. No checks had been made at the turnstiles so they were clearly easy to get in the ground in the first place. Nobody got hurt though and the noise was deafening. Relentless support for 90 minutes at a home game where there's no away fans present - and the team aren't playing particularly well - ticks all of my boxes. It finished 0-0. Spartak Trnava had a goal disallowed which prompted another flow of items to be thrown on the pitch. And there was still time for a comedy sending off on the final whistle when an opposition substitute entered the pitch prematurely, got booked, called the referee a **** and then got sent off. Pretty pointless, but enormously good fun, obviously. We'd had tremendous fun on that terrace. It was a sort of Boca Juniors Lite. I'd sung and danced along the with the home fans. Participated in a song that requires a little shimmy along to the left of the seats, and then over to the right. Clapped along to a few ditties just like they do in North Korea. Frankly, it was like a 90 minute dream. Football fans at their best. Maybe things are a lot more malevolent when Slovan Bratislava roll into town, I hope not because on this evidence Spartak Trnava fans are absolutely superb. The best in Slovakia? Probably. For another version of events by the excellent James Baxter CLICK ME. For more professional photos of the ultras taken from another stand CLICK ME. For lots more photos of that night and the rest of the trip CLICK ME. For an excellent video put together by The Ball is Round blog CLICK ME. Follow European Football Weekends and The Ball is Round on Twitter. I saw Wales beat Slovakia 5-2 at this ground in September 2007. Craig Bellamy was outstanding in that game, probably his best ever performance for Wales. The locals seemed ok. I, too, loved the experience in the “Boiler” and I appreciate your match report as I spent my time (beer in gloved hand – hey, it was cold(ish) – one the large area at the top of the main stairs and became surrounded by Ultras, joining them in their antics, which rarely involved actually watching the match. As you say, confetti abounded; it was perfect squares of cut-up newspaper and magazines (I saw Julianne Moore staring up at me at one point). How do they make it? I do know it arrives in big, cardboard boxes and is handed out without favour. One little Ultra sprayed beer over me as he got closer and closer and shouted at me that he and his pals hate the big, modern, plastic football of the EPL. This was the real thing, he declared, again and again. Can’t disagree with that. Their chat was punctuated with much “friendly” prodding and extremely hard “friendly” back-slapping and moving drunkenly closer and closer. “Don’t be afraid…” I thought about explaining the British notion of “non-contact” discussion and personal space but settled for: “No, I’m not afraid. I’ve been to Eastern Europe many times.” This seemed to mystify them somewhat. In fact, I was not afraid. Not, that is, until I naively listed the nation states of the EFW contingent. When I mentioned Israel, one of the more reasonable Ultras told me quietly: “Isreal? Do not show him to us.” They are rabidly anti-Semitic and I think they told me they hate the Bratislava club mainly because it was “founded by Jews”. The intellectual section of the Boiler Boys had now moved on to more esoteric conversation but I was genuinely concerned the hard men may come after us (or, more specifically, me) post-match and resolved not to get trapped in a corner. I shook hands (Jamaica-style) with one of the Ultras at the final whistle. “What can I say?” he told me. “Have a good life.” He seemed to know I may not return to Trnava.